This is a blog written for a general audience. To the readers who (unlike me) actually know what they're talking about with respect to asteroids and astronomy, my deepest apologies. I hope that this is at least amusing, and I would be thrilled to learn of my mistakes. I do not have time or expertise to fully cite every idea or concept, but I have attempted to use phrases that, if googled, would point the reader in the right direction. Onwards! A network of hardware-agnostic all sky cameras positioned all over the world can achieve a dense covering of the entire sky, with respect to stellar occultations of near-visible stars down to magnitude 7, out to the orbit of Jupiter at 5.2 AU. Such a system, decentrally implemented and operated, could rapidly survey the entire population of inner solar system asteroids larger than tens of meters, in just a few years. 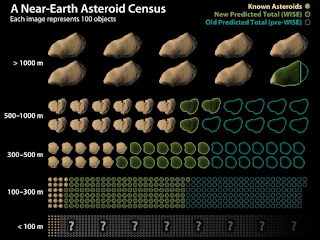 Gathered data will also reveal information about asteroid size and shape, irrespective of the body's albedo. Extensions of the fundamental concept using hardware readily available in 2018 could track solar system bodies of similar size well out into the Kuiper Belt, albeit at substantially increased cost. Asteroids, millions small rocky bodies that exist primarily between the orbits of Mars and Jupiter, are still relatively unexplored and undiscovered. Of the estimated two million or so larger than 1km, only about 100,000 are known, skewing strongly towards the larger and closer specimens. In addition to their intrinsic scientific value and interest, asteroids routinely impact the Earth, with consequences ranging from a bright fireball (particle size <1cm) to major damage to a city (<10m, such as Chelyabinsk in 2013) to total destruction (<100m, such as Tunguska in 1908) and even planetary scale extinction events (Dinosaurs!!!). 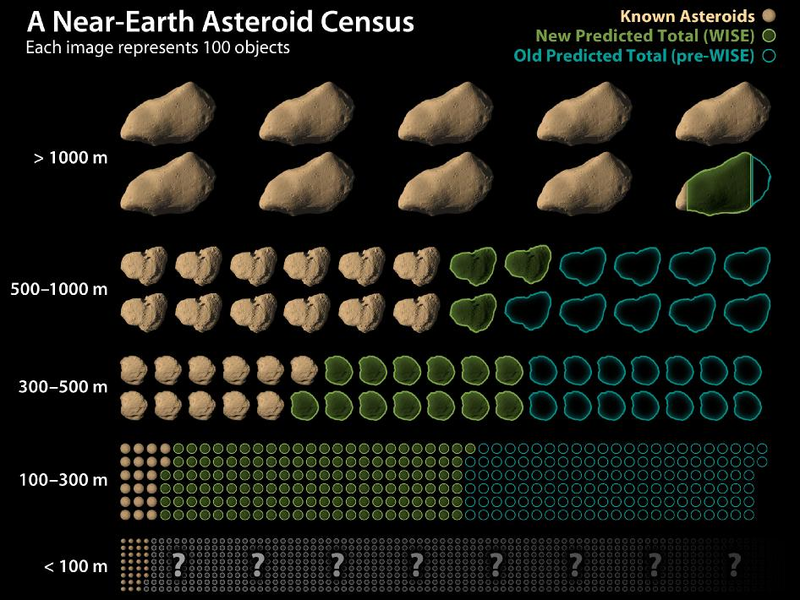 This diagram shows what fraction of near Earth asteroids are currently known. 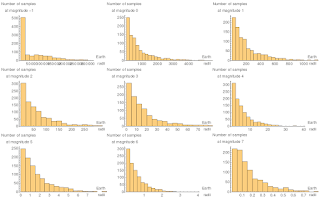 Each image represents 100 objects, and any of them would be a really really bad day if they hit Earth. While 916 of an estimated 981 near-Earth asteroids larger than 1km are known, vast numbers of smaller asteroids remain undiscovered. Smaller asteroids are hard to discover with telescopes using light reflected from the sun, and not just because they're tiny. They're also often surfaced with material as dark as charcoal, making them extremely difficult to see with reflected light. Stellar occultations have been used to study asteroids for more than 50 years. A stellar occultation occurs when an asteroid or planet passes between the observer and a distant star, momentarily blocking its light. Because asteroids are quite small relative to the Earth, a stellar occultation makes a "track" across the Earth's surface, such as the one shown below. 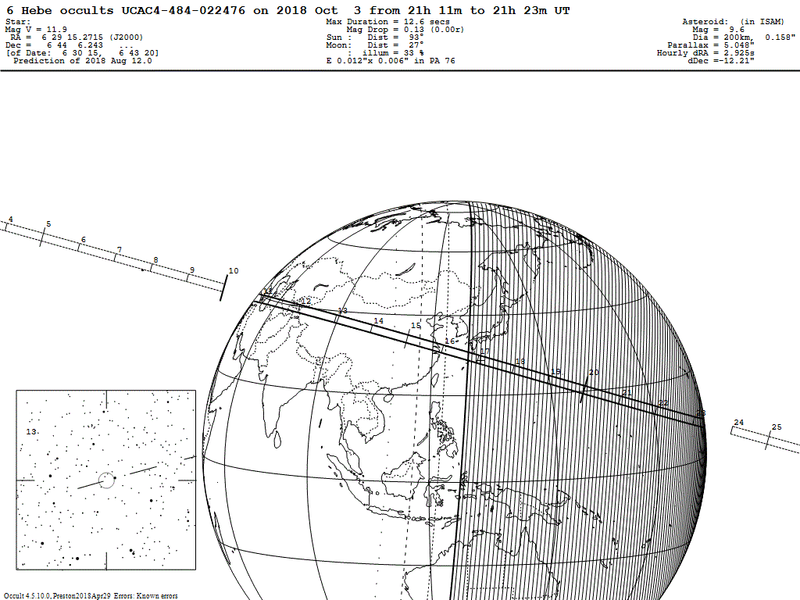 asteroidoccultation.com lists predicted occultations of known asteroids passing the Earth so that a network of astronomers can point their telescopes at the correct star and, these days, take a video of the star momentarily winking out. When all the videos are combined with their GPS locations and times, the exact shape of the shadow, and hence the asteroid, can be derived. With a powerful enough telescope, hundreds of thousands of stars are visible. The Earth itself is about 12000km wide, and subtends a virtual beam into space in the direction of every star. If a body passes through any of these beams, a sufficiently sensitive photometer will detect the changing brightness of the corresponding star. As the Earth moves through its orbit, this pompom of beams will scrape out a volume within the solar system. If there are enough beams, essentially the entire volume of the inner solar system will be covered in the course of one year. This diagram shows the Earth's orbit projected on a sphere of radius 3AU. Each star traces out an ovoid, depending on its declination. Combining the ovoids of thousands of stars covers the entire sky with a forest of beams, through which the odds of an asteroid passing without being seen goes to zero. 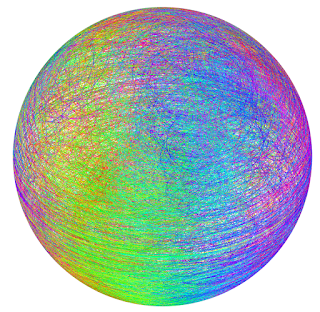 In this diagram, each line is much wider (by roughly 10 times) than the actual beam subtended by the Earth, and the colors are a happy accident. In order to estimate the density of coverage, I randomly generated points in the sky then measured how close they were to the nearest beam, for stars brighter than a certain level. If they passed within an Earth radius, then they would generate a stellar occultation. I considered that good enough for detection. 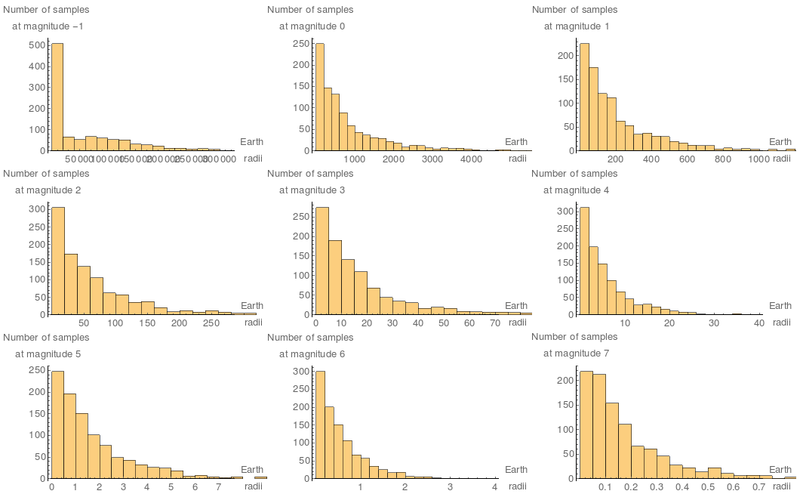 These histograms show the numbers of samples that approach an Earth beam. While the brightest stars do not effectively cover the night sky, my rudimentary calculations show that 82% of the entire sky is covered in one year by just the brightest 5000 stars out to a distance of 3AU, which is roughly the middle of the asteroid belt. Including magnitude 7, which are just dimmer than visible, most points would be detected multiple times per year. It is captivating to think that if humans were able to keep records and time extremely accurately, they could have used this method in ancient times with only their eyes! 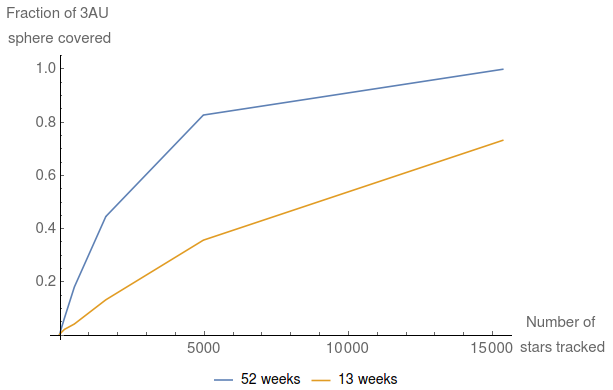 This graph summarizes the above histogram, showing that tracking of 5000 stars (M6) is adequate to cover 82% of sky in a year, while tracking of 15000 stars (M7) covers 70% of the sky in only 13 weeks. Why is this better than the previous approach? The traditional survey method has significant advantages. A single telescope, operating in an automated fashion, can survey the entire (night) sky in a night or two. 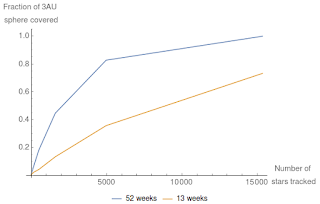 Comparing multiple subsequent days enables rapid discovery of moving objects, and completely automated pipelines such as NEO-WISE (https://neowise.ipac.caltech.edu/) have resulted in the discovery of many thousands of asteroids. In contrast, an automated stellar occultation asteroid discovery system requires a coordinated network of thousands or millions of all sky video cameras, sophisticated statistics and software, patience, and must contend with the existing, non-ideal distribution of stars. Stellar occultation has one principle advantage. Because stars are so bright and so far away, they are effectively point sources. Asteroids much too small and dark to be seen using traditional telescopes can still block light from distant stars, enabling their detection. In this way, stellar occultation thumbs its nose at the inverse square law, though without violating any laws of physics. When I began thinking about this problem last week, it occurred to me that this was, in some sense, the astronomy analogue of the STED/STORM family of super-resolution microscopy techniques, in that it exploits the statistically regular point spread function of a point source. Super-resolution microscopes are also real headaches to implement, but worthwhile for particular use cases. In this case, because there are millions of undiscovered and otherwise undiscoverable asteroids, it might be worth the trouble to attempt detection using stellar occultation. As previously hinted, like any other experiment there are numerous technical challenges to overcome. This is a non-exhaustive list! - Diffraction. For sufficiently distant stars and small asteroids, the occultation produces a diffraction pattern on the surface of the Earth rather than a discrete, hard-edged shadow. Given better than binary photometry, occultation diffraction patterns can be measured using the proposed network. - Seeing/scintillation. The Earth's atmosphere tends to wobble and in doing so produces 'twinkle' that naturally varies the brightness and apparent location of stars in the sky. This introduces a noise source that drowns out the occultation signal from particularly small asteroids. Collocating sensors within 10m, necessary to detect asteroids of similar scale, would suffer correlated scintillation noise. Combining data from a more broadly separated set of sensors could still detect the smallest asteroids, provided there were enough of them. - Light pollution/sky glow. In many parts of the world, light pollution affects the visibility of the dimmer stars, particularly over the timescales (milliseconds to seconds) necessary for stellar occultations. Additionally, the sky is too bright to see almost all stars during the day, so the network would only be useful for searches during the night. In practice, apparent magnitude 7 and brighter stars still densely cover a 3AU sphere even without a space-based detector system, which can point much closer to the sun. - Other sky objects. Planes, birds, clouds, meteors, insects, and satellites can all occult stars or introduce noise. Fortunately, occulations occur on a planetary scale, so more local noise sources can be readily filtered out. Indeed, a widely distributed network of all sky cameras would also be useful for tracking meteors and discovering the remnants of long-period comets, which also pose an existential threat to humanity. - Sensor density. 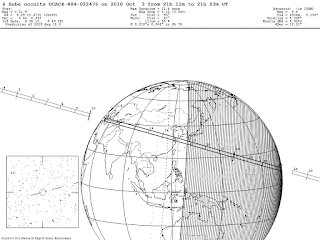 The mean free path of any given occultation track between sensors on the Earth determines how effective the proposed network is at detecting every occultation, and particularly the occultations by small objects that have narrow tracks. My analysis assumes that millions of sensors based on mobile phone hardware are positioned over the entire dark-sky land area of the Earth. Note that the network would still have substantial scientific value at smaller scale, but comprehensive exploitation of the opportunity requires an extensive network on Earth. - Stellar radius. All the stars in the sky that are visible to the naked eye are either very bright, very close, or both. For particularly wide stars in the night sky, a small, close asteroid won't completely eclipse it. Instead of going completely dark for a fraction of a second, the star will only dim slightly. Star catalogs include star angular diameter, so excluding problematic stars for smaller objects is trivial. - Statistical inference. The proposed network will require a multifaceted data pipeline to first discover and measure an occultation, reconstruct an occultation track, generate candidate object sizes and orbits, and then produce predictions of future occultations that can be used to refine orbits. Yes, a dense covering of the sky guarantees repeated occultation observations of every body over a period of years, allowing orbital elements to be calculated. Nonetheless, processing all the data efficiently is a worthy problem. - Pixel edges. As an example of hardware specific issues that complicate mere photometry, an all sky camera will not track individual stars. This means that stars will move through the visual field, crossing pixel boundaries and, in some cases, even sharing pixels with other stars. The detector software will need to include a star tracker so it knows what it's looking at and doesn't confuse sensor noise and pixel boundaries with an actual occultation. Detector orientation is otherwise hard to measure. - Hardware heterogeneity. As much as I would love to spend someone else's money on a million ARGUS-IS gigapixel cameras (https://en.wikipedia.org/wiki/ARGUS-IS) and slap on a 3m fish eye lens, the proposed system will have to contend with hardware heterogeneity. This means that none of the cameras will be perfect, they will all be different, and the software they run will have to have sophisticated hardware models to compensate for these differences. One compelling option is to use retired smart phones with fish eye lens attachments and solar panels for power, and send reduced data back to base with the cellular network. - Deep sky limitations. Finally, the inverse square law does come back to bite when considering outer solar system uses of such a network. Stellar occultations for Kuiper belt object discovery and atmosphere measurement is an area of active research (e.g. https://www.lpi.usra.edu/books/ssbn2008/7022.pdf), but even the system I'm envisioning wouldn't be capable of producing a *dense* dragnet of the sky that far from the sun. There are two main reasons for this. The first is that the projection of Earth's orbit (parallax) gets smaller and smaller, reducing the length of the locus by a factor 1/r. The second is that the projection of the Earth's disk also covers less of the sky, shrinking the area of coverage by 1/r^2. This still scales better than direct discovery, which scales as 1/r^4! But surveying the sky at 60AU would require 20^3 = 8000 times as many stars as at 3AU, necessitating using all the stars up to magnitude 16, which is comparable to the brightness of the nearer Kuiper belt objects themselves! All things being equal, an aperture 100 times greater would be required to gather photometric data of stars this faint, while the sheer number of objects would complicate automated tracking. Furthermore, stars at this magnitude are predominantly located in the galactic plane and are not comprehensively surveyed. I'm not saying it's impossible, but it's a different sort of problem. As of today, my best vision for deploying this instrument is the development of an app that runs on smartphones. Each phone would use its camera, an aftermarket fixed focus fisheye lens, GPS, Bluetooth, and a cellular connection, and power source such as a solar panel or very long USB cable. Each phone's software incorporates a star tracker that monitors the brightness of each star while it sits within a pixel, checking for a dimming that is statistically at variance from background sensor noise. A candidate detection is tagged with location and the specific star, then compared within a local decentralized cluster of 2-15 phones within a ~100m area. Given a concurrence, the event is uploaded using a cellular or satellite network in compact text form, containing the following information: GPS location, start and end time, degree of extinction, an event reference number, phone configuration, orientation, and ID numbers, (most likely) star, and event's declination and right ascension. Local weather data (e.g. percent of the sky visible) is also included. The cellular connection is also used to receive information about predicted tracks. If the event is thought to involve a diffraction pattern, ring system, or atmosphere, then more detailed photometric data can be taken and uploaded for analysis. On a remote server, incoming events are binned by sky location. Any event that does not have corroborating occultations of the same star are thrown out. Multiple events are reconstructed into tracks, depending on where they were observed, and a further statistical test ensures that a majority of the local clusters along the track all detected the event. For diffraction patterns, all relevant data can be processed together to pull the signal from the noise. With sensors capable of tracking magnitude 7 and brighter stars, essentially all of the estimated two million asteroids larger than 1km (and billions of smaller ones) will be detected every year. Earth over(under)takes the slower moving main belt asteroids frequently enough that nearly every asteroid will be detected multiple times over a few year period. The final task of the central server is to process occultation event detections to deconflict coincidences. That is, if two million asteroids are detected twice, there are four thousand billion possible double detections. The vast majority of these can be excluded on physical grounds, but of the remaining, say one billion candidate orbits, each will generate at least one predicted occultation per year. This may seem like a lot, but each camera is tracking about 7000 stars at once, for 31 million seconds a year - a total of 210 billion star-seconds! With a decent sized dataset, most of the remaining candidate orbits can be excluded and asteroids definitively discovered. Finally, combining information from multiple occultations, the asteroids' shapes can be deduced. Earth has a surface area of 510.1 million km^2. As of 2018, the are of the single largest telescope is 84m^2. The total area of all the optical telescopes is less than 0.002km^2. The total area of all human pupils is about 0.7km^2. All the rest of the star light that falls on the Earth is wasted! While radio astronomers have long used telescopes across the world for very large baseline observation, the use of such a huge canvas for visible observation is limited by the severe physical difficulty of recording a visible light signal at about a million billion Hertz. With stellar occultation, this limitation can be removed. Using the entire Earth and millions of artificial eyes to stare at the night sky is the only practical way to discover and catalog every asteroid that orbits between Earth and Jupiter, including every main belt asteroid, down to a size of tens of meters.